Development of the world’s most expensive car is far from finished. One of the standout cars at the 2019 Geneva Motor Show was the one-off Bugatti La Voiture Noire, a modern-day interpretation of the iconic Type 57 SC Atlantic. With an eye-watering price tag of $18 million, it’s earned the title of the most expensive new car ever built. What we saw at the show wasn’t the finished product, however, as Bugatti still has a lot of work to do. He added that work on the design concept started just three months before it debuted in Geneva. Given its current state of development, don't expect the La Voiture Noire to be finished for another 18-24 months. Remember, a standard Chiron takes around nine months to complete from the initial configuration to delivery. The La Voiture Noire on display at the event was essentially a shell with no interior or even an engine. This explains why a video showing the car on the move while leaving the show sounds so silent. The brake calipers also aren’t functional as they can be seen moving with the wheels. Bugatti most likely fitted the display car with an electric powertrain so it could be driven to and from the show. 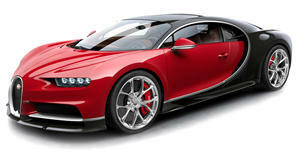 The final car, on the other hand, will use Bugatti’s beloved 8.0-liter, 16-cylinder quad-turbo engine. Power output hasn’t been increased, meaning the La Voiture Noire will have 1,479 horsepower and 1,180 lb-ft of torque on tap to match the Chiron, Chiron Sport, and Divo.